The Dsco INVENTORY page is a great tool for managing your inventory directly in a web portal. Even if you regularly send EDI or Excel files to Dsco to update your inventory, you can still use the web portal to manually edit a few items as necessary. Access your Dsco inventory page by clicking on the INVENTORY tab on the top of the page (https://app.dsco.io/inventory). 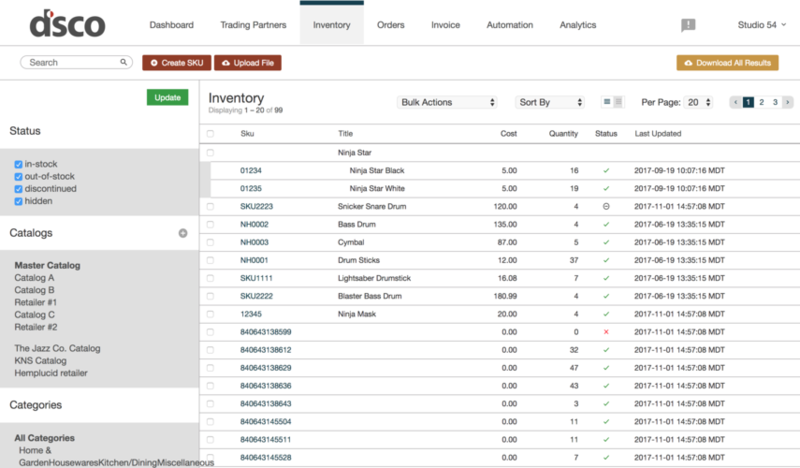 Use this inventory page to create new items, upload or download inventory spreadsheets, and create catalogs of inventory to share with your trading partners. Make sure you also check out the rest of the documentation on this page for more information on item statuses, searchable fields, and data requirements. Please note that if inventory statuses in Dsco do not match the quantity listed in Dsco for an item, Dsco will automatically infer the stock status based on the quantity submitted for that item. Use this status for all items that have a positive quantity, and for which you want Dsco to send positive feeds to your trading partners.If you give a quantity of 0 and a status of in-stock, the quantity will stay at 0 and the status will automatically be changed to out-of-stock. Use this status for all items that have a 0 quantity, and for which you want Dsco to send 0 feeds to your trading partners. If you give a status of out-of-stock, but your item has positive quantity, the status will be automatically changed to in-stock. Items with a discontinued status should always have a 0 quantity. If you set a status of discontinued, but the item has positive quantity, the status will automatically be changed back to in-stock. A discontinued item is an item you do not anticipate having in stock again this season (or perhaps ever). An out-of-stock item is an item you anticipate will be back in stock again soon. So if an item is simply out of stock and you anticipate that it will be available again soon, do not use the discontinued status. Dsco recommends using the hidden status for any items you errantly upload to Dsco. For example, if you have created items by mistake, setting the status to hidden causes Dsco to send a 0 feed to your trading partner for the following 7 days, after which the item falls off the feed. The hidden status can also be used to hide inventory from a retailer before items are completely ready to sell online. For example, a supplier could upload some of the product data beforehand and set the status to hidden, ensuring that the product info could later be updated without affecting retailer partners. Once the product is ready to go, the supplier can change the status from hidden to in-stock and retailers will begin receiving updates for the item. SKU: All characters must be one of the following: a-Z 0-9 . , : ; \' ` ~ # & _ ! ( ) - + / \ | ?. The total length must be less than 64 characters.